BEIRUT: Lebanon's political crisis deepened Monday as the Cabinet approved a UN draft to form an international tribunal to try former Premier Rafik Hariri's assassins, despite the resignation of six ministers. Official sources quoted by Reuters Monday said the Western-backed government of Premier Fouad Siniora would send the draft to UN headquarters in New York and wait for the final text on the court. Speaking to reporters after the Cabinet session, Siniora called for unity to overcome the political crisis. "Here we are today on the road to revealing the truth and achieving justice through the court ... that will be formed to stop this series of terrorist and criminal acts," Siniora said. "In a historic meeting, the Cabinet approved unanimously by those present the draft of the special tribunal," he added. The approval came despite a government crisis sparked by the resignation of six ministers, including those from Hizbullah and Amal, which accuse the ruling majority of monopolizing power. The premier said the government's decision was meant "to reject and confront attempts to assassinate Lebanon ... and to tell the criminals that we will not give up our right to achieve justice despite the difficulties." "Our brothers who could not join us in taking this decision were actually with us - in our hearts, our positions and our decision," Siniora said in an appeal for unity. 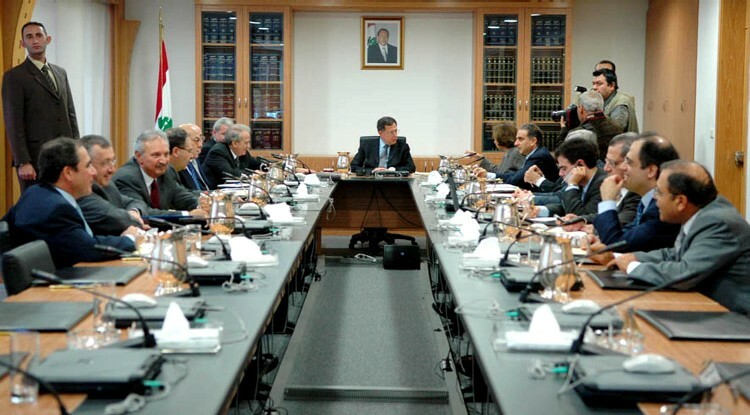 Following the session, Siniora telephoned Lebanese and Arab leaders to discuss the latest developments concerning the international tribunal. Among the Arab leaders called were Saudi King Abdullah, Egyptian President Hosni Mubarak, Jordanian King Abdullah II, Yemeni President Ali Abdullah Saleh, Arab League chief Amr Moussa, Bahraini King Hamad Issa Bin Khalifah and Emirati Foreign Affairs Minister Abdullah Bin Zayed. The premier also called the various heads of Lebanon's religious sects. Siniora officially received the resignation of the six resigned ministers on Monday. However, the prime minister replied by letter to the resignations immediately, refusing the resignations and calling for the ministers to return to their posts. Information Minister Ghazi Aridi said the convening of the Cabinet Monday was "100 percent constitutional." Parliamentary majority leader MP Saad Hariri, said the government's approval of the UN draft "is a blessed step toward revealing the truth and realizing justice" in the February 14, 2005 assassination of his father and 22 others, in addition to a string of attacks targeting politicians and journalists dating back to October 2004. But President Emile Lahoud said any decisions reached during Monday's session have no constitutional or legal value as they were passed by an authority that had lost its legitimacy. Hizbullah MP Hussein Hajj Hassan accused the ruling majority of exercising a "hegemony and monopoly on decision-making." Hassan told AFP that Hizbullah objected to the manner by which the ruling majority approved the UN document. "The majority is trying to tell people that the Lebanese are in conflict over the tribunal, and this is totally untrue. We are not against the tribunal - all Lebanese agree on this issue," he said. Hassan added that Hizbullah would only agree to return to the government if its request for a "blocking minority" in the Cabinet was met - a demand seen as an attempt to stymie all future government decisions. esigned Labor Minister Trad Hamadeh said Siniora's Cabinet had three choices: "Either resign or replace the Shiite ministers or eliminate the reasons behind our resignation." "Anything else means the parliamentary majority is violating the national covenant," Hamadeh said in a statement. The Free Patriotic Movement, Hizbullah's main political ally, said the government had lost its legitimacy because it no longer represented all religious sects. "Because the Shiites are no longer present in Cabinet, the Cabinet becomes automatically incapable of governing. It has lost its legitimacy," FPM leader MP Michel Aoun said Monday. At the UN in New York, US Ambassador John Bolton said his country was prepared to move quickly in the Security Council to approve the tribunal "once we receive formal word form the government of Lebanon." - With agencies, additional reporting by Leila Hatoum.